This is the H. venosa var. tesselata we're all familiar with. You can clearly see the difference between it and tesselata 'simplex' posted a few days ago. Several have asked how I'm doing. Thank you; I'm doing fine. I just can't lift anything heavy for a while (per doctor's orders) and that's frustrating. Thanks for your concern. A little change of pace today. 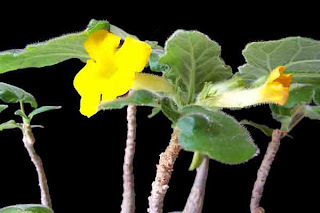 The flowers in the first photo are on Uncarina roeoesliana. 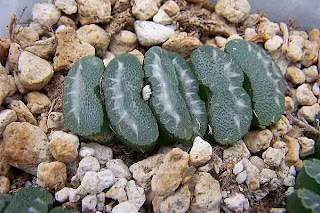 The second photo includes both U. roeoesliana (in the front row) and U. peltata (in the back row), showing the difference in the caudex. The U. peltata flowers have a purple throat. They're from the island nation of Madagascar. These flowers are pollinated by beetles and the usual method of hand pollinating the flowers doesn't work. They like a fair amount of water, with - of course - adequate drainage. 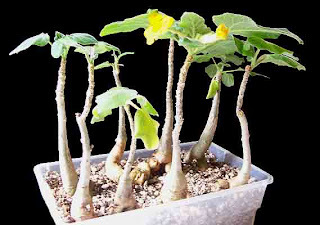 The following picture isn't from our plants. It shows the seedpod on a plant in Madagascar. A question has been asked about the differences between Haworthia venosa ssp. venosa and ssp. tesselata. I don't have any ssp. venosa, but I'll post a habitat photo taken by David Martin. The main described difference is in the degree of reticulation. Where the plants labeled "simplex" fall in this variable species I don't know. I should have noted a few days ago when I posted Jatropha berlandieri (Torrey 1858) that this is an invalid synonym for Jatropha cathartica (Teran & Berlandier 1832). Since J. cathartica has priority, it would be the correct name. Old habits are sometimes hard to change. 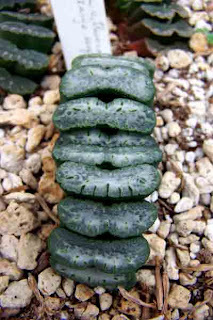 With that said, here's a new photo of Haworthia venosa ssp. tesselata var. simplex. Of course, there is no variety simplex. Or, at least, it's not accepted as a variety by most anyone. It's just a part of the variability of the sub-species tesselata. Be that as it may, it's a nice variation. 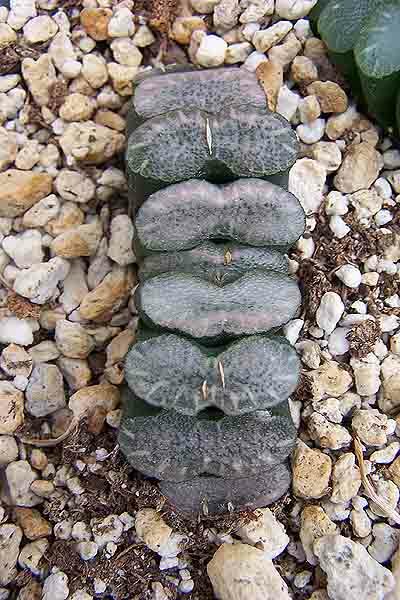 The last of my Gasteria posts for a bit, this is Gasteria 'Frosty', a cultivar of Gasteria brachyphylla. You can't see it too well in this photo but the edges are translucent and the frosty-blue leaves are sometimes accented with splashes of green. Quite impressive. We don't specialize in gasterias but somehow we always end up with many, many of them. This is one of my favorites. 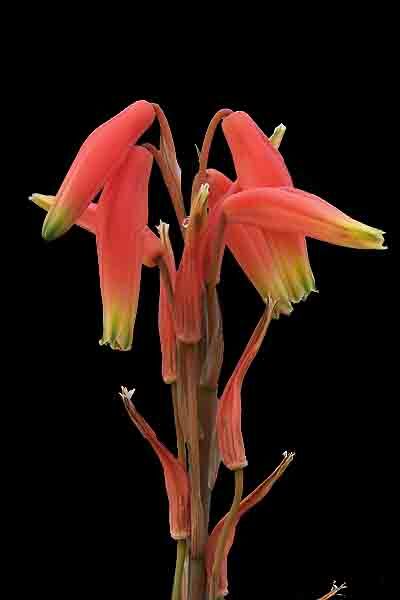 It's small growing, has outstanding orange-red flowers and a rough-textured leaf. And, as a bonus, it's very easy to grow. These are true miniatures, staying quite small, but multiplying to form an extensive mat of plants. 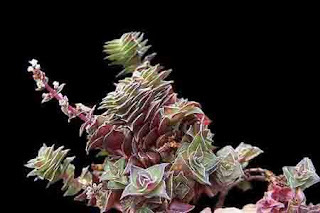 I admit that I'm a sucker for some of the miniature succulents; just because they're small and require the use of a magnifying glass to fully discover their beauty doesn't make them unworthy of growing. 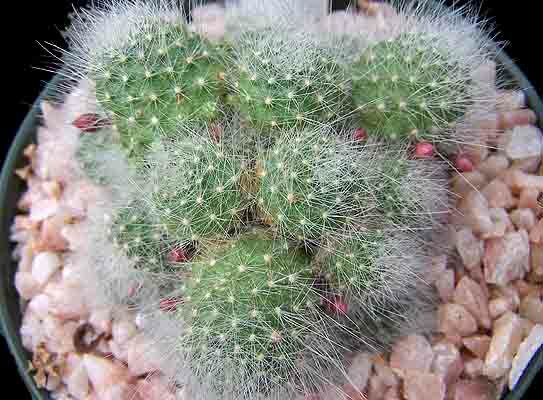 Place these next to the truncatas from a few days ago and it's hard to imagine they're from the same genus! Today wasn't the day to get out into the greenhouses to take photos. Too many other things had to be done. 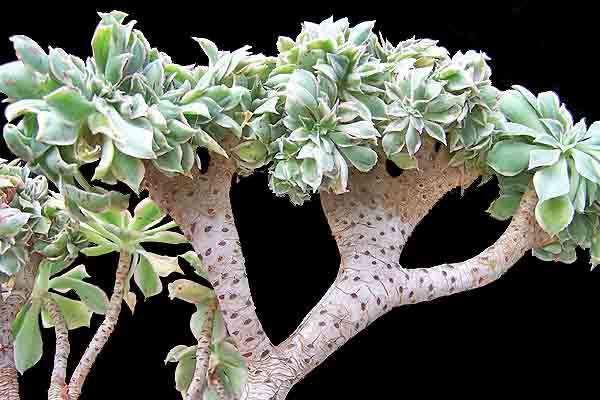 So...out of the archives comes this photo of the well-known variegated Hindu Rope plant, Hoya compacta 'Regalis'. 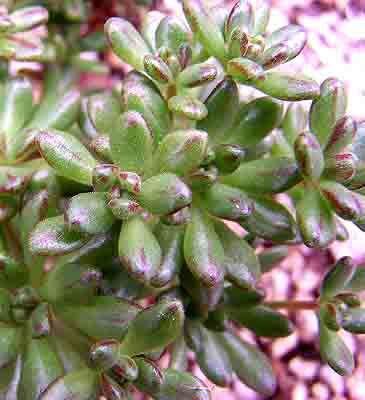 They do seem to be very attractive to mealy bugs, but other than that, they're exceedingly easy to grow...tolerant of a lot of neglect. And as soon as the weather permits they all go outside where they'll be hit with a good blast of water from the hose and "bye-bye" mealies. And the flowers...wow. We've always had a soft spot for this odd little creature...Jatropha berlandieri, It's just coming out of dormancy for us and grows it's green growth very rapidly at this time of year. I'll be trying to get some new photos soon as I'm now feeling a lot better. 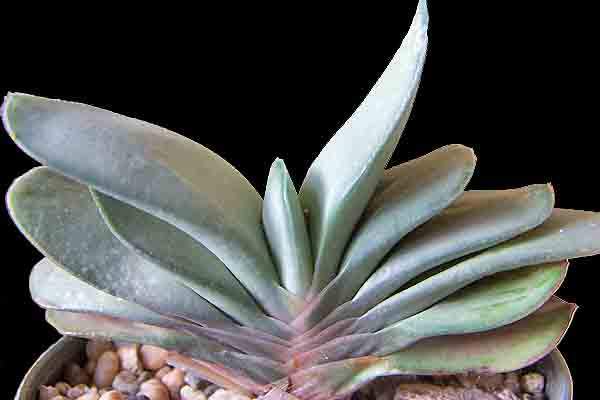 Gasteria batesiana is a favorite among collectors because of it's amazing leaves and relatively easy care. Cliff dwellers in nature, they of course prefer a well-drained substrate. 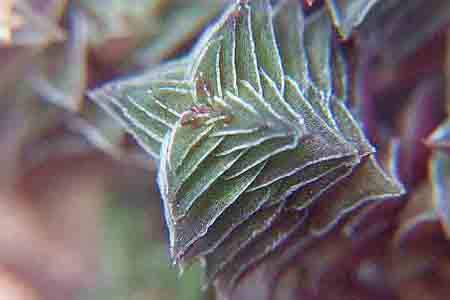 The leaves are stiff and somewhat brittle but are a very rewarding plant to have in the collection. 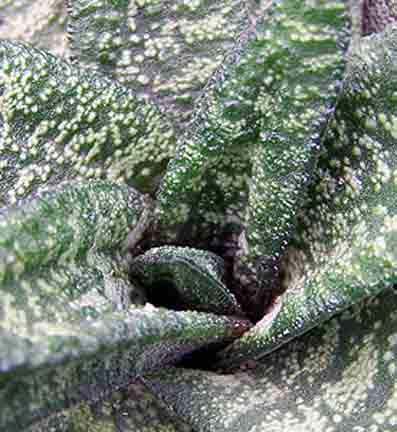 This is a recent close-up taken of one of the plants in the main greenhouse. 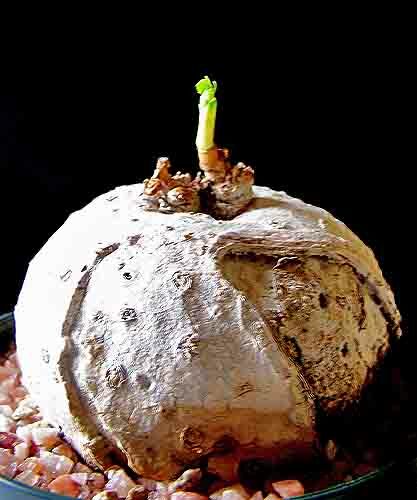 Just recently Lynn-Marie replanted a group of cuttings of Trichodiadema densum and she took a picture of the beginning tubers forming beneath the soil level. These are going to make some very nice specimen succulent bonsais in a very short time. Sorry for the photo being a little out of focus. It happens when you're in a rush. From the Canary Islands, this small-growing Aeonium gets its species name from the resemblance to Sedum leaves. Grows up the 40 cm. 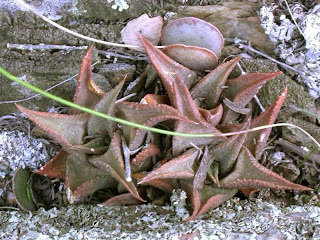 tall in nature, with fat little leaves which are less than 1.2 cm long and often marked with red lines. Just a note to let you know I'm recovering nicely from surgery but I'm not really up to doing a lot of posting yet. 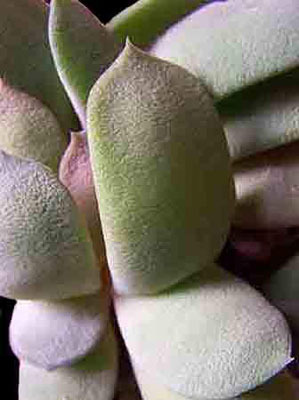 However I felt I need to post a brief word of concern for our many succulent growing friends in Japan, many of whom are now dealing with some very difficult circumstances. We hope that you are all OK and have not had serious loss. Our prayers and thoughts are with you. I'm off to surgery early in the morning, so just a quick post for tonight. These are all from seed, showing the variability which is part of the enjoyment of growing seedlings. You just have to have patience and a love of the plants. I don't know how I'll be feeling tomorrow night, but if I feel OK I'll get another post off then. But now it's sleep - about 5 hours of sleep! This is done as out patient surgery and it's not a big deal, but I just don't care for it very much. I went about 60 years without one surgical procedure. And then in the past 11 years I've made up for it. Oh well, without one of those surgeries I most likely wouldn't be here today. Another sign of Spring. 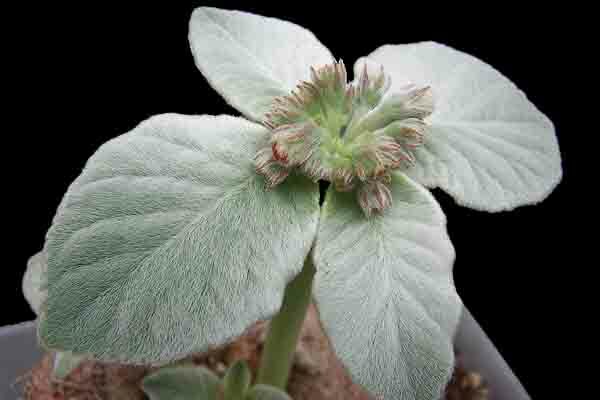 The Sinningia leucotrichas are budding up and their new leaves are spreading out, showing off their white fuzzies! 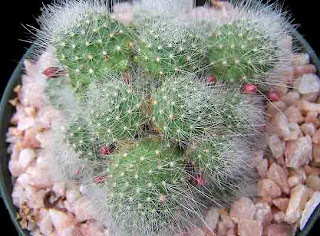 In short order, large, tubular, pink-red flowers will also be showing their stuff. 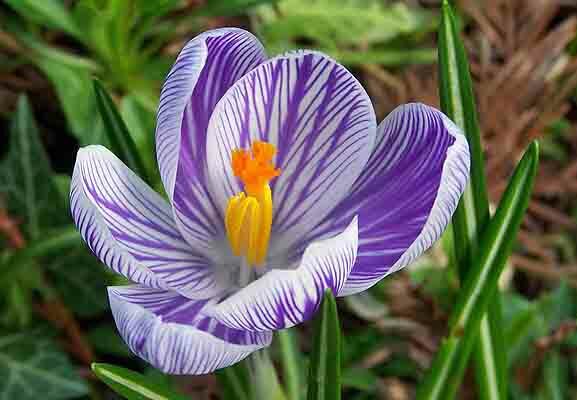 Spring can't be too far away! 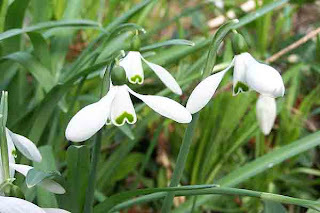 The early spring flowers are coming on with gusto now: snowdrops, crocus, daffodils, forsythia and camellias. And in the greenhouses, the aloes continue to bloom and some of the cacti are showing their buds. And so it goes. Another cycle comes around and it's just as wonderful as the last. I may be 71 but I'll never get tired of it. There's plenty I do get tired of - wars, intolerance, fear and hatred, to name a few - but the breaking forth of the seasons' beauty - never! I've come to really like these crests. They're quite easy to grow and each one is unique in its character. When the occasional "normal" offset happens, it's easily removed and rooted for the normal A. 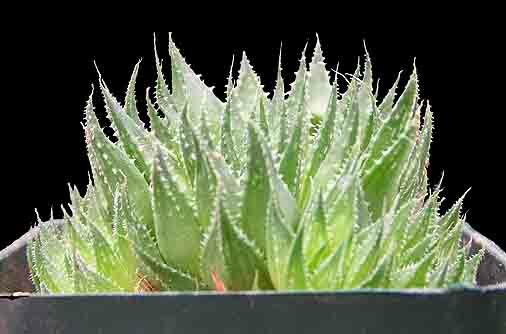 'Sunburst', an outstanding plant in itself. The weather was lovely today and I was able to get a fair amount of "heavy lifting" work done. I'll be restricted regarding lifting for six weeks following surgery on Friday, so got to get some things done up front. It was a lovely day today, nice enough to sit out on the deck for an afternoon drink today. I also gave me an opportunity to set up the tripod and get some photography done. 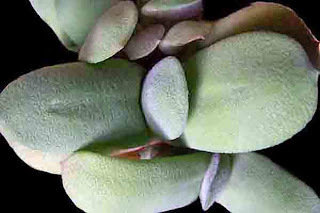 This is a close-up of Crassula capitella subsp. 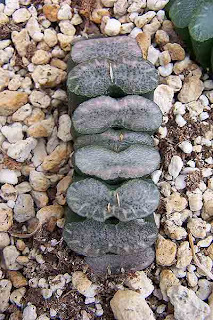 thyrisiflora showing its wonderful symmetry. Now, of course, this is very much a close-up! 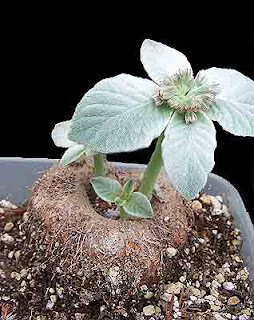 This is a small plant. Echeveria 'Ramillette', called the "Orange Bouquet" for good reason, has been blooming it's little heads off. This was taken a couple of days ago while the outside temperatures were hovering at record lows for this time of the year.